Pandemus (ARL-18) was laid down as LST-660 20 July 1944 by the Chicago Bridge and Iron Co. Seneca Ill. reclassified ARL 18 on 14 August 1944; named Pandemus 11 September 1944; launched 10 October 1944; sponsored by Mrs. Laura Sauter Gasperik; placed in reduced commission 21 October 1944 for transit to New Orleans decommissioned 3 November 1944 for conversion to a landing craft repair ship by Todd Johnson Dry Dock Inc. and commissioned in full 23 February 1945 Lt. Comdr. Howard B. Shaw Jr. USNR in command. 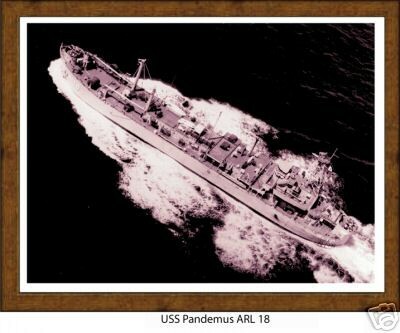 Pandemus departed New Orleans 12 March 1945 for shakedown out of Panama City Fla. and returned for alterations 26 March. On 4 April she stood down the Mississippi River bound by way of the Panama Canal the Hawaiian and Marshall Islands the Mariana Islands and Ulithi to Hagushi anchorage Okinawa. There she tended and repaired infantry landing craft. Pandemus touched at Guam and Saipan on her way to San Pedro Bay Leyte Philippine Islands. She serviced landing and small craft in that area and then at Okinawa and Shanghai China. She put to sea from Shanghai 21 December 1945 and steamed by way of Pearl Harbor to San Pedro Calif. arriving 5 February 1946. Six days later she was on her way to Mobile Ala. where she arrived 3 March. She shifted to Algiers La. 4 July and decommissioned there 23 September 1946. Pandemus recommissioned at Green Cove Springs Fla. 14 December 1951 Lt. John H. Thomas in command; fitted out at Merrill Stevens Shipyard Jacksonville visited Norfolk 23 January 1952 and arrived at the U.S. Naval Minecraft Base Charleston her home port 30 March and began 16 years of service supporting minesweeping operations along the Atlantic Coast from Newport R.I. to Key West Fla. in the Caribbean and in the Gulf of Mexico. She decommissioned 30 September 1968 and was struck from the Navy List 1 October 1968. She was sunk as a target in late 1969. Pandemus received one battle star for World War II service.